MicroWorld is coming to Jordan ! Thanks to our newest partnership with MFW (MicroFund for Women), it is now possible to finance projects in Jordan on MicroWorld! 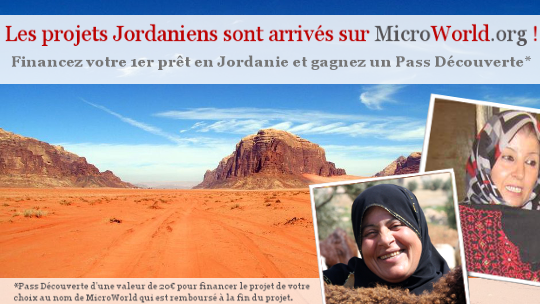 After the Palestinian Territories, MicroWorld gives you the opportunity to finance microentrepreneurs in Jordan ! Thomas from our Operations team spent two weeks in Aman to put this partnership in place with the MFI MFW (Microfund For Women). - Discover Jordan through the pictures taken by Thomas during his trip! Between two oceans, Jordan is a small country populated exclusively by nomads and where desert is everywhere you go. Jordan is today considered as the most pacific country from the middle-east. Jordan, known as “the well-travelled bridge between sea and desert”, is a land of geographical contrasts between the Jordan fertile valley and desert canyons, bordered by influent countries such as Israel, Palestinian Territories, Syria, Iraky and Saudi Arabia. Covered by eight high level performance MFIs, the microfinance sector is the most significant one within the Middle East Region. Discover now the first Jordanian projects and win a €20 Discovery Pass* for example by financing Muna who wishes to buy raw materials to create jewelry or Nawal who wants to purchase new accessories for her hairdressing salon! * Until 10th October 2013, MicroWorld offers a €20 Discovery Pass for your first investment in Jordan. A Discovery Pass allows you to finance the microentrepreneur of your choice in the name of MicroWorld. At the end of the project, MicroWorld recovers the money invested. You will receive by email your Discover Pass at the end of the period.